The Indian tiger has an orange coat patterned with broad black stripes. It has black ears, each with a winking white spot on the back, powerful forepaws, and a long banded tail. The total length of the tiger from the tip of its nose to the end of its tail is between 2.6 to 3 meters and it weighs anywhere between 135-230 kgs. The average life span of a tiger in the wild is about 14 to 16 years. South China Tiger (Panthera tigris amoyensis) found in China. 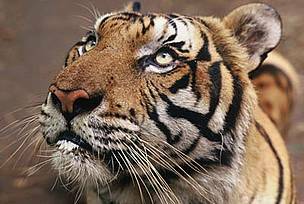 The population found in Peninsular Malaysia has been given a status of separate sub species Panthera tigris jacksoni. The three sub species of tigers that became extinct in the past century are: the Bali Tiger (Panthera tigris balica) that was found in the Indonesian island of Bali, the Javan Tiger (Panthera tigris sondaica) that was found in the Indonesian island of Java and the Caspian Tiger (Panthera tigris virgata) that was found in Iran, Iraq, Afghanistan, Turkey, Mongolia, Kazakhstan, Caucasus, Tajikistan, Turkmenistan and Uzbekistan. Recent reports indicate that the South China tiger is also extinct in the wild. Recent genetic studies indicate that the Caspian and Siberian tigers may have been the same sub species. The tiger has an orange coat patterned with broad black stripes. It has black ears, each with a winking white spot on the back, powerful forepaws, and a long banded tail. The total length of the tiger from the tip of its nose to the end of its tail is between 2.6 to 3 meters and it weighs anywhere between 135-280 kgs. The average life span of a tiger in the wild is about 14 to 16 years. The Indian/Bengal tiger is found mainly in India, Nepal, Bhutan and Bangladesh. The diet of an Indian tiger mainly consists of large wild ungulates such as chital (Axis axis), sambar (Cervus unicolor), barasingha (Cervus duvacelii), nilgai (Boselaphus tragocamelus) and gaur (Bos gaurus) and other animals such as the wild pig (Sus scrofa). It is an opportunistic feeder and can also kill large prey such as elephant calves (Elephas maximus), gaur (Bos gaurus) and wild buffalo (Bubalis arnee). Tigers may occasionally also kill sloth bear and leopards as well as smaller prey such as peafowl, langur, jungle fowl, hare etc. Due to their large body size tigers are not good tree climbers like leopards. They can only climb along large leaning trees. But tigers are excellent swimmers and love water. Tigers are known to swim between islands in the Sunderbans. White tigers are not a separate sub-species, but are white in color due to an expression of recessive genes. Interestingly, the white tigers are found only among the Indian tigers and can only be seen only in captivity now. 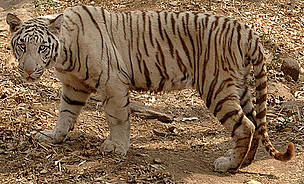 The last white tiger reported in the wild was captured in the forests of Rewa in the state of Madhya Pradesh. The white tigers found in the zoos today are most likely descendants of this one tiger that was caught from the wild in Madhya Pradesh and later bred in captivity. White tigers have pink noses, white-to-cream coloured fur, and black, grey or chocolate-coloured stripes. Their eyes are usually blue, but may be green or amber. Tigers occupy an important place in the Indian culture. Since ages, it has been a symbol of magnificence, power, beauty and fierceness and has been associated with bravery and valor. The tiger also has a significant place in Hindu mythology as the vehicle of Goddess Durga. 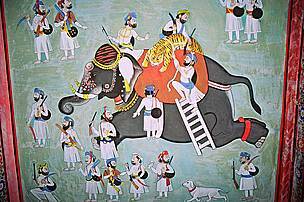 In olden times, hunting of tigers was considered to be one of the highest acts of bravery by kings and noblemen. The tiger is a unique animal which plays a pivotal role in the health and diversity of an ecosystem. It is a top predator and is at the apex of the food chain. Therefore the presence of tigers in the forest is an indicator of the well-being of the ecosystem. Protection of tigers in forests protects habitats of several other species. Indirect benefits include protection of rivers and other water sources, prevention of soil erosion and improvement of ecological services like pollination, water table retention etc. The absence of this top predator is an indication that its ecosystem is not sufficiently protected. Tigers are both a Flagship and Umbrella species. As a Flagship species they are important for conservation and as Umbrella species, conservation of tigers leads to conservation of other species. Tigers and high intensity biotic disturbances such as poaching and stealing of kills do not go together. If the tigers in the wild have to survive, it is imperative that other species of wild animals that are directly or indirectly a part of the food chain must also thrive. Therefore, the survival of the tiger is an important yardstick to measure the existence of a healthy forest ecosystem. Tigers have been featured extensively in Indian art. Yes, tigers in the wild are facing severe threats. There has been steep decline in the tiger population all across the world. At the beginning of the last century, it is believed that worldwide, there were possibly many thousands of tigers in the wild with about a few thousands of those in India. A WWF-WCS survey found that tigers have lost 93% of their historic range. In the last 10 years, tiger habitat decreased by an alarming 45%. Today, tigers occupy just 7% of their historic range. The current tiger population in India is estimated to be Around 1706 according to a WII-NTCA survey. The decline in the tiger population in India can be attributed to many factors. The major reason is the growth in human population. Since independence large chunks of prime tiger habitats have been lost forever to agriculture and developmental activities. In India till the middle of the last century, people killed tigers in the name of sport. Tiger hunting was officially banned only after the enactment of the Wildlife (Protection) Act in 1972. Today, increasing biotic disturbances, uncontrolled poaching of prey, urbanization, mining and quarrying; and poaching of tiger for its body parts gravely threaten the future of the tiger. Bones and other body parts of the tigers are used in Traditional Chinese Medicines (TCM) and their skins are used for making Chubas (the traditional robe worn by the Tibetans). It is this illegal market for tiger skins and parts in China and Tibet that remains as one of the most serious threat to wild tiger populations in India. 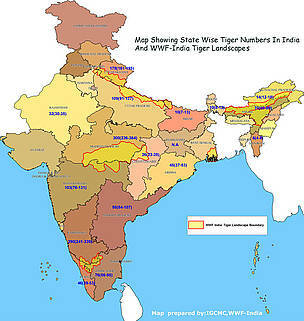 The major stakeholders in tiger conservation in India are Government of India (Ministry of Environment and Forests), State Forest Departments, the National Tiger Conservation Authority (formerly known as the Project Tiger) and local communities. Tourism Departments, media and NGOs such as WWF-India and several other organizations also support tiger conservation initiatives. The process of estimating the number of tigers in a given area is called ‘Tiger census.’ This exercise provides us with an estimate of tiger number, density and change in tiger indices - a measure of tiger occupancy in a given area. It is conducted at regular intervals to know the current tiger populations and population trends. Besides estimating the number of tigers the method also helps to gather information on the density of the tiger populations and associated prey. Many different methods are used to estimate the number of tigers. The most commonly used technique in the past was ‘Pugmark Census Technique’. 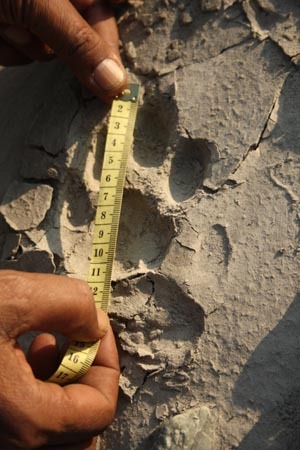 In this method the imprints of the pugmark of the tiger were recorded and used as a basis for identification of individuals. Now it is largely used as one of the indices of tiger occurrence and relative abundance. Recent methods used to estimate the numbers of tigers are camera trapping and DNA finger-printing. In camera trapping, the photograph of the tiger is taken and individuals are differentiated on the basis of the stripes on the body. In the latest technique of DNA fingerprinting, tigers can be identified from their scats. For centuries humans and wild animals have co-existed in India. This is mainly because the human populations were much lower and the forest areas were large. However, over the past few decades, the human population has grown manifold, thereby creating great pressure on forest resources. Large areas on which the forests were vast and undisturbed have given way to human habitations and settlements. Grazing by domestic cattle in forest areas has resulted in disease out-breaks among wild herbivores, and also reduced availability of fodder, forcing wild herbivores to depredate crops that adjoin forests. In retaliation, villagers sometimes resort to stealing power from power lines and setting up live electric fence to kill crop raiders. Due to lack of sufficient wild prey base in the forests, leopards frequent villages looking for food. In the process, humans, particularly children and women get killed. Lack of prey base also forces carnivores such as tigers, leopards and dholes (wild dog) and wolves to kill domestic cattle for survival. Villagers may again retaliate by poisoning these wild animals. 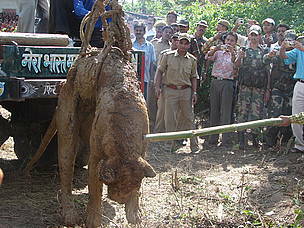 There are also activities like stealing of animals killed by tigers lead to injury and death of human beings. How does WWF-India contribute to Tiger Conservation? To protect the tiger and to ensure its survival in the wild, WWF-India supports tiger conservation initiatives undertaken by the Government of India. 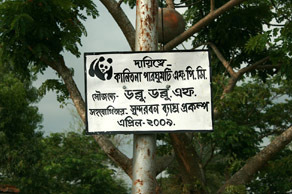 The activities undertaken include strengthening protection measures in National Parks, Sanctuaries and Tiger Reserves, helping local communities to reduce their dependence on forest resources, mitigating human-wildlife conflict, providing a scientific database that will serve as a basis for sound management of tiger habitats, and capacity building for conservation of the species. TRAFFIC-India, a collaboration of WWF and IUCN, has restarted operations to curb illegal trade in wildlife that is drastically affecting the wildlife populations in India. Solar lamps to prevent tiger straying into villages. Yes, you can help save the tiger. 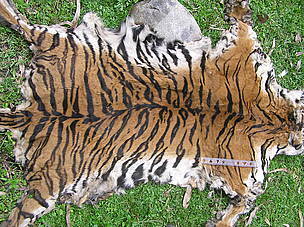 Say ‘NO’ to tiger trade by refusing to buy tiger parts and items prepared from tiger derivatives. Speak to tiger and wild ungulate poachers and persuade them to give up poaching. You can also contribute by spreading awareness about tiger conservation issues and threats and also by supporting NGOs that work towards the same. Most importantly you must support green development initiatives to help restore the forest cover and reduce biotic pressures.